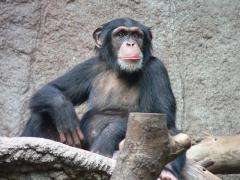 (PhysOrg.com) -- Chimpanzees look up to those they consider to be more prestigious, echoing the way that young people admire celebrities such as David Beckham and Cheryl Cole, according to a new study. Researchers found that apes copy the actions of those they consider to have high status within their group. The study is a collaboration between Professor Andrew Whiten of the University of St Andrews and Drs Victoria Horner and Frans de Waal at the Yerkes National Primate Research Center in Atlanta. Earlier studies by Whiten and an international team of primatologists showed that chimpanzee populations in Africa differ from one another in their use of tools, communication and foraging techniques. For example, some populations use stones to crack nuts and others do not. To answer the question, Professor Whiten and his colleagues allowed chimpanzees to observe the successful foraging skills of either older, higher-ranking apes with good track records of solving puzzles, or lower ranking ones with no such experience. They noted apes overwhelmingly copied the behaviour of the higher status individuals. The high-ranking female apes were Georgia, who has a long history of introducing new behaviors, inventing a new style of grooming at age fifteen, and Ericka, a matriarch who manages her group with a delicate touch, grooming nearly every individual frequently, ensuring her broad support within the group. The researchers concluded that the popularity of Georgia and Ericka as role models reflected their high prestige positions in the group. They believe that if similar biases operate in wild animal populations, the spread of cultural behaviors may be much shaped by the prestige of certain individuals. The research will be showcased in ‘Culture Evolves’, an exhibit in the Royal Society’s Summer Science Exhibition, to be held in London’s Southbank Centre, 25 June - 4 July. The free, public exhibition will showcase cutting edge science in the UK.